You’re looking at the only car in Ford’s lineup not scheduled for cancellation within the next two years. What a bizarre thought. 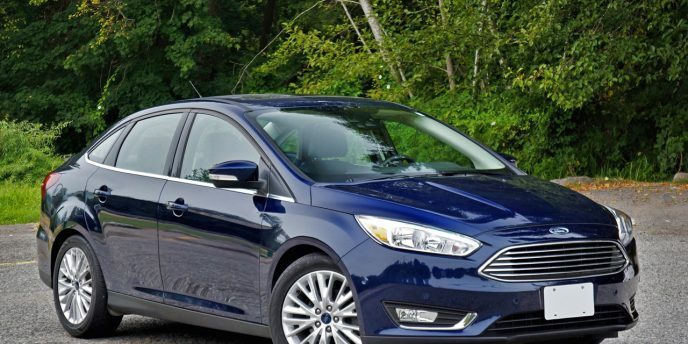 Many correctly guessed that Lincoln’s MKZ and Continental would eventually get the axe, or for that matter Ford’s own C-Max (already gone) and Taurus, but eliminating blue-oval favourites like Focus and Fusion, not to mention Fiesta, is something few outside Ford’s inner circle would likely have considered. Yet here we are, and only time will tell whether this decision from Dearborn’s upper management is shortsighted or eventually revered as sage-like wisdom. Of course, I’m happy they chose to save the Mustang amid such blue-oval carnage, but don’t think I missed the irony of it being the sole car in Ford’s lineup not to wear a blue-oval badge. In fact, there’s no mention of the automaker at all, from the galloping stallion within the front grille and “5.0” engine designation on the front fenders, to the big “GT” model insignia taking centre stage at the rear, you’d be hard pressed to know its parentage if the car weren’t so legendarily Ford. Likewise inside, where the same airborne steed crests the steering wheel hub, and in my particular example “RECARO” takes claim to the sculpted front sport seats, there’s no sign of the brand behind this iconic symbol of American ingenuity. The Mustang was the first pony car after all, and continues to lead its rivals by a wide margin in prestige and sales. In fact, it doesn’t just lead its small contingent of pony car challengers (pun intended), but out muscles every other sports up the sales chart car as well. Of course, sales leadership is nothing new for Ford, with its boldly branded F-Series pickups dominating the light truck market, its Edge and Explorer collectively controlling the mid-size crossover SUV category, its Expedition outselling everything else in the large SUV segment, its Transit on top of the commercial van industry, and its Escape consistently amongst the top three compact crossover SUVs. If you’re shaking your head in disbelief, you owe it to yourself to drive one of the above, as each is worthy of its success. Likewise, if you haven’t taken a Mustang for a spin in a while, you’re in for an even greater treat. And I didn’t mean spin a Mustang literally, being that it’s a lot more difficult to get the rear end sideways now that Ford has fitted a highly stable independent rear suspension (IRS) between the rear wheels. That change came as part of an exhaustive 2015 model year redesign, and the move caused a great deal of controversy amongst diehard Mustang fans that loved the old car’s lighter weight live rear axle and its benefit to drag racing, but for the majority of sports car fans, who’d rather go fast around corners instead of just in a straight line, it was a gift from the mechanical gods, or at least a bunch of blue-oval engineers. It was and still is the most hooked up Mustang in history, something I previously claimed in a 2015 Mustang GT Premium Convertible review, not to mention subsequent road tests of a 2016 Mustang Ecoboost Fastback, 2016 Mustang GT Convertible, and a 2017 Mustang GT Convertible, and something I attest to again with this 2018 Mustang GT Premium Fastback. Take note the 2018 model saw a new optional 10-speed automatic in both turbocharged 2.3-litre Ecoboost four-cylinder trims and 5.0-litre V8-powered GTs, the former of which I recently tested in 2019 Premium Fastback guise, while this GT, priced from $47,288, and the base Mustang, which starts at just $28,988, come with a six-speed manual gearbox. And by the way, I sourced all of my pricing at CarCostCanada, where you’ll find detailed trim, package and option pricing, as well as info on available rebates and otherwise hard to get dealer invoice pricing that could save you thousands. Other 2018 updates include a meaner looking new grille that melds ideally with a more aggressive hood design, while stylish LED headlights are now standard across the entire Mustang lineup. Additionally, new LED taillights provide a fresh take on the Mustang’s classic triple vertical lens design, while these are underscored with a new bumper and lower fascia. A number of changes improve the Mustang’s interior too, highlighted by upgraded materials quality including contrast-stitched leather-like soft-touch synthetics used for most of the dash top, each side of the centre console and much of its top surfacing, plus the door uppers, inserts and armrests, engine turned-style medium-grey metallic inlays across the entire instrument panel, some really upscale satin-metal detailing brightening key points throughout the cabin, and a new fully digital TFT primary gauge cluster. The high-resolution display is plenty colourful, especially on the left dial where the temperature gauge shows a light blue for cool, aqua blue/green hue for medium and red for too hot. The same aqua gets used to highlight the area just below the tachometer needle, while just to the right an orange line represents the highest engine rev point from your most recent acceleration run (mine boasting 7,200) just ahead of all the red markings noting the engine’s no-go zone. The centre area houses a multi-information display that’s filled with functions. Ford places a sweet looking set of analogue meters on top of the centre stack for oil pressure and vacuum (in turbocharged trims it gets substituted for a boost gauge), the latter useless unless you’re mechanically inclined, but cool looking for sure. Just below is Ford’s Sync 3 touchscreen interface, which remains one of the better infotainment systems within the mainstream volume sector despite others catching up, complete with a clear rearview camera featuring dynamic guidelines, accurate navigation with detailed mapping, climate settings, apps and much more, while you can adjust the dual-zone automatic HVAC system’s climate settings from analogue switchgear just below too, or perform other functions from a slick row of aluminized toggles just underneath. It all melds retro and modern nicely, while all of the buttons, knobs and switches fit together well and are properly damped for a quality feel. The Recaro-sourced front seats noted earlier are sensational, with excellent support in all the right places. When combined with the tilt and telescopic steering column I was able to adjust everything for near perfect comfort and control, which is critically important in a car that can go a quickly as this GT. I was actually surprised the rear seats had enough room for smaller sized adults, because most 2+2 sports cars don’t. Likewise the trunk is a decent size for a sports coupe, and includes 50/50 split-folding rear seatbacks for stowing longer cargo. 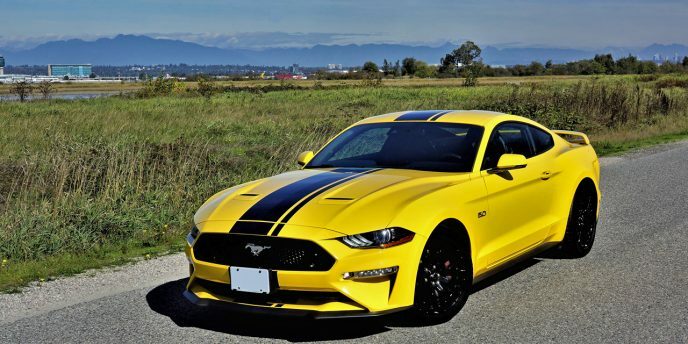 Practicality is one of the reasons the Mustang sells so well, however, drool-worthy styling aside, most ante up to this GT for its performance benefits. Certainly the previously noted base four-cylinder turbo is plenty quick for its low entry price, with 310 horsepower and 320 lb-ft of torque on tap, the GT’s 460 horsepower and 420 lb-ft of torque is hard to argue against, nor is the soul-soothing gurgle emanating from its twin tailpipes. Does it make sense to buy a car just for the sound of its exhaust? If so, the Mustang GT is probably your best choice this side of an Aston Martin Vanquish S. Of course, along with its delectable sounds the GT provides insanely fun straight-line acceleration, superb high-speed stability and sensational handling. It locks into its lane like no previous pony car, Mustangs feeling a lot lighter and nimbler than their competitive stable mates that comparatively seem to overdose on muscle with less finesse, which is the key reason I’d opt for a GT over one of its rivals. This choice is personal for sure, so I can appreciate why someone might choose a Challenger or Camaro, but sales numbers speak for themselves, and I believe the Mustang keeps winning the pony car popularity contest for good reason. Still, it’s not perfect. Remember that row of aluminized toggle switches on the centre stack? The rightmost one swaps driving modes from a Normal mode that defaults automatically, to Sport Plus mode that merely takes a flick of the toggle upward. One more toggle up chooses Track mode, while another is optimized for the Drag Strip, or in other words it removes all traction and stability controls. Flick the toggle upwards again and you’ll access a mode for Snow/Wet conditions, before it all goes back to Normal, and you can start all over again as desired. Sounds good so far, right? While seemingly smart on paper, in application this setup is anything but. The problem lies in execution, with Ford having chosen to only allow the system to toggle upwards. This means you’ll need to flick through all of the performance modes that remove traction and stability control when trying to optimize the driveline for slippery conditions. Crazy huh? What would happen if you were having some fun at high speeds in Sport Plus mode when coursing through a winding riverside road at lower elevations and then, when the road started to climb and snow appeared on the pavement, you needed to access Snow/Wet mode, forcing you to pass through Track and Drag Strip modes along the way? That might actually be quite dangerous. All Ford needs to do to remedy this is provide downward movement to the toggle, which would let you go from Sport Plus to Normal and then Snow/Wet mode in two easy steps. Seems like a simple enough idea to me. Now, regarding Dearborn’s shortsighted or sage-like decision over its car lineup. I think we can all agree that the Mustang should stay, and not just because it’s legendary, iconic, brilliantly fun to drive, fabulous to look at, and so on. As mentioned a moment ago, similar accolades will be claimed by fans of the Mustang’s key competitors, which could be reason enough to keep the Challenger and Camaro in the respective fleets of Dodge and Chevrolet, but as usual truth lies in those just noted sales numbers along with the long-term viability of the various plants that produce them. 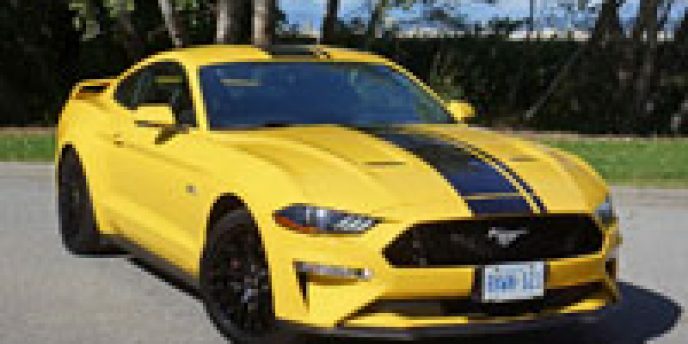 At the close of Q3 2018, year-to-date U.S. sales of this trio registered 61,619 units for the Mustang, 52,313 for the Challenger, and 39,828 for the Camaro, while Mustang deliveries in Canada were actually stronger per capita at 7,298 units, and Camaro beat out the Challenger north of the 49th with 2,320 units compared to just 1,966. While Canadian pony car sales don’t look too bad compared to U.S. numbers, YTD Q3 2018 Mustang sales are actually down 4.6 percent compared to the same nine months of last year, whereas Camaro deliveries have dropped by 8.0 percent and the Challenger has lost a whopping 32.0 percent of year-over-year sales. Comparing calendar year 2017 sales numbers to modern-day highs forces us back to 2005 for the Mustang when it found 10,045 new buyers in Canada, which is a 16.9 percent drop compared to 2017’s 8,348-unit tally, while comparing Camaro’s high of 4,113 units in 2010 and 2,952-unit 2017 total reveals a popularity pullback of 28.2 percent. Interestingly, 2017’s total of 3,422 units is the newest Challenger’s all-time high, which would be a good sign if it weren’t for sales south of the border. Ford sold 166,530 Mustangs in 2006 (still a far cry from the 607,568 they built in 1966), which makes its 81,866 total in 2017 seem paltry by comparison and represents a 50.8-percent pummeling over the past dozen years, while Chevy’s 88,249-unit Camaro tally in 2011 shows a less drastic fall of 23.0 percent thanks to 67,940 deliveries last year. When it comes to percentages the Challenger looks best, with its 66,365-unit all-time high merely 2.7 percent healthier than its 2017 number of 64,537. Whether or not a pony car lives or dies in today’s SUV-crazed market might actually come down to where it’s built. The Mustang gets a pass thanks to its Flat Rock, Michigan assembly, a plant that will become even more available when the aforementioned Continental goes the way of the dodo in 2020. That Ford is planning to replace the Conti’s spot on the line in 2021 with an autonomous EV should mean there will be plenty of room for the Mustang to flourish well into the future, being that EVs are microscopically small sellers at best, but who really knows what the future will truly bring. As for the Camaro, its Lansing Grand River Assembly plant appears to be on shaky ground due to sharing space with two discontinued Cadillacs, the ATS and CTS, so who knows where Chevy will build it if they retool the plant for new SUVs as is being suggested, or shutter it completely as some in the rumour mill are touting. The Challenger may be in even worse shape, mind you, being that it suffers from two challenges, sharing space and underpinnings with the Chrysler 300 that most expect will be cancelled (although a recent upsurge in sales might change FCA’s mind), and being built here in Canada where very real tariff issues and trade uncertainties are causing automakers to rethink their production strategies. No doubt even Ford hopes these two muscle car competitors survive, as competition is critical in the pony car paddock. With such business out of the way, all that’s left to do is hightail it down to your Ford dealer in order to snap up one of the last few 2018 Mustangs left or one of the new 2019s. Being that you’ll probably find more of the latter, don’t expect to see my tester’s Triple Yellow paint, a $550 option that’s no longer on the 2019 menu. It’s not the only colour nixed from the new model year, with Lightning Blue having made way for Velocity Blue, and beautiful $450 Royal Crimson substituted for loud and proud Need for Green, a no-cost option. You can add various stripes if you want, and “upgrade” the transmission to the aforementioned 10-speed auto for either year, but take note the GT’s six-speed manual is rev-matching capable for 2019, so you’ll sound like a pro when swapping cogs. I should also mention the GT’s variable active exhaust is now available with the 2.3-litre Ecoboost four, while California Special and Bullitt trim packages add style and substance, the latter available in special Highland Green paint, just like Steve McQueen’s original. I won’t go into detail about all of the higher-end performance trims for either model year, but suffice to say the sky’s almost the limit when it comes to upgrading your future Mustang, so study up and ask lots of questions when visiting your local dealer. Trust me when I say that this pony car can dramatically change its persona from trim to trim, so you’ll want to figure out which version is best for you before deciding. Have fun making up your mind. 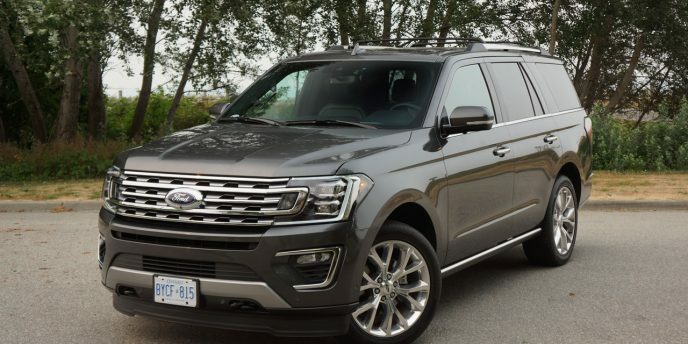 If you need to go large, the redesigned 2018 Ford Expedition has a lot to offer. The full-size SUV has been completely reworked from the ground up for 2018, with attractive new sheetmetal made mostly from aluminum, just like the blue-oval brand’s F-150 pickup truck that shares its T3 platform architecture, plus more power for the automaker’s already robust 3.5-litre turbocharged Ecoboost V6, a new fuel-efficient 10-speed automatic transmission, and more. The new aluminum body joins up with a high-strength steel frame to reduce the Expedition’s curb weight by 44 to 90 kilograms (97 to 199 pounds) depending on trim, or 135 kilos (just under 300 pounds) for the longer Expedition Max, yet despite such a significant elimination of overall mass the upgraded SUV is more than 100 mm (4.0 inches) longer with the regular wheelbase and 28 mm (1.1 inches) lengthier with the long wheelbase Max, while its wheelbase gets stretched by nearly 90 mm (3.5 inches) in the regular length model and by 15 mm (0.6 inches) in the Max, and it gains more than 25 mm (1.0 inch) from side to side. Most people purchase an Expedition for passenger carrying and load hauling purposes, and to that end the new model’s larger dimensions make for an even roomier cabin than the previous generation’s already generous proportions, while the cargo compartment grows to a maximum of 2,962 litres (104.6 cubic feet) in the regular length model and 3,438 litres (121.4 cubic feet) with the Expedition Max, the latter providing 478 litres (16.9 cubic feet) more what-have-you capacity than the regular Expedition. This means 4×8 sheets of building material can be laid flat on top of the load floor with the tailgate closed, while you only need to press one of four individual buttons mounted on the cargo wall to lower the exact seat you want. Additionally, the regular wheelbase model can now tow up to 4,218 kilos (9,300 pounds), which is an increase of 45 kg (100 lbs) over its predecessor and also the full-size SUV segment’s best result. Making all the pulling possible is a version of Ford’s twin-turbocharged 3.5-litre Ecoboost V6 that’s good for 375 horsepower and 470 lb-ft of torque in the majority of trims including this Limited model, although an even more robust variation on the theme gets 400 horsepower and 480 lb-ft of torque in top-tier Platinum trim. I’ll give you details about the new 10-speed automatic in an upcoming review, and comment on its full assortment of advanced driver assistance systems, such as active park assist that can actually pull this big SUV in and out of parking spots, lane keeping assist and adaptive cruise control with stop-and-go, plus what I’ve found most useful so far, the bird’s-eye view from its 360-degree surround parking camera. The Expedition now gets a version of the Explorer’s terrain management system too, allowing the choice of driving styles, the capability of maximizing traction on various road/trail surfaces, and the ability to set the SUV up to either tow a trailer or have it hauled behind a larger vehicle (although that’s hard to imagine), all from a dial on the lower console. Additional tech worth mentioning includes wireless device charging (if you have a smartphone new enough to make use of it), Wi-Fi hotspot capability, and rear-seat entertainment. Ford’s superb Sync 3 infotainment touchscreen takes care of most other electronic duties, while six USB ports, four 12-volt power outlets and one household-style 110-volt power outlet provide plenty of power points. Lastly, Ford includes 17 cupholders for holding all those personal devices, or alternatively for keeping all occupants’ thirst quenched. That would be a total of eight occupants, by the way, although my tester included second-row captain’s chairs that reduced total people hauling capacity to seven, while I should also mention this new Expedition is the first full-size SUV to incorporate tip-and-slide second row seats that make access to the third row really… easy or difficult? If you haven’t driven a Mustang for a while, I highly recommend you take one out for a spin. Not literally, the spin I mean, but then again it’s a lot more difficult to get the rear end sideways now that Ford has fitted a highly stable independent rear suspension (IRS) between the rear wheels. That change came as part of an exhaustive 2015 model year redesign, and the move caused a great deal of controversy amongst diehard Mustang fans that loved the lighter weight live rear axle and its benefit to drag racing, but for the majority of sports car fans, who’d rather go fast around corners instead of just in a straight line, it was a gift from the mechanical gods, or at least a bunch of blue-oval engineers. Rather than delve into just how good the Mustang’s handling became four years ago and how much better it drives since its most recent 2018 update in this “In Our Garage” segment, I’ll admit that it’s easily the best hooked up Mustang in history and, until my full road test review comes out, I’ll point you to an old road test of the 2015 Mustang GT Premium Convertible to learn how I felt about it when the IRS initially arrived, or you can reread my reviews of the 2016 Mustang Ecoboost Fastback, 2016 Mustang GT Convertible, and 2017 Mustang GT Convertible). Take note the 2018 model sees a new optional 10-speed automatic in both turbocharged 2.3-litre Ecoboost four-cylinder trims and 5.0-litre V8-powered GTs, the former of which I recently tested in Premium Fastback guise (review coming soon), while this GT, priced from $47,288, and the base Mustang, which starts at just $28,988, come with a six-speed manual gearbox (check CarCostCanada.com for all the trim, pricing and options details, plus rebate info and dealer invoice pricing). Other 2018 updates include a meaner looking new grille that melds ideally with a more aggressive new hood, while stylish LED headlights are now standard across the entire line Mustang lineup. New LED taillights provide a fresh take on the Mustang’s classic triple vertical lens design, these underscored by a new bumper and lower fascia. A number of small changes improve the Mustang’s interior, highlighted by upgraded materials quality and a new optional fully digital TFT primary gauge cluster. The aforementioned base engine makes a substantive 310 horsepower and 320 lb-ft of torque, so there’s no need for the long gone V6 anymore, while this GT’s V8 puts out a sensational 435 horsepower and 400 lb-ft of torque, not to mention a soul-soothing gurgle from the twin tailpipes that’ll make your adrenaline surge. As nice as the 2018 Fusion Hybrid Titanium is to look at, and as enjoyable it is to live with, we’d better deal with the gargantuan elephant in the room before delving into any details. As most will already know, earlier this year Ford announced that all of its cars except for the legendary Mustang and a new compact crossover wagon dubbed Focus Active will be cancelled in North American markets by 2020, which means the car I’m reviewing right now is living out the rest of its life on borrowed time. Whether or not losing its substantial market share in the subcompact, compact and mid-size classes is a good idea is a monologue probably best left for another time, and to be fair none of us on the outside can truly know what’s best for the Dearborn-based automaker, so any criticism about such a seismic shift in product offerings wouldn’t be worth mentioning. Facts are facts, however, and Ford will be giving up third place in the mid-size segment in the Canadian market and fourth in the U.S., with the Fusion’s 2017 totals being 9,736 and 209,623 respectively. While selling hundreds of thousands of any model might initially sound great, it’s also important to point out that 2016 to 2017 year-over-year Fusion sales plummeted by 32.5 percent in Canada and 21.1 percent in the States, while the Canadian deliveries have dropped by 51.6 percent since the Fusion’s high five years ago in 2013, while U.S. popularity has contracted by 31.7 percent since that market’s high in 2014. This of course has much to do with the rise in popularity of SUVs and simultaneously shrinking car market, but nevertheless some competitors haven’t fallen as far. Now matter how you slice it losing the Fusion is a shame (particularly in Hybrid, Energi and Sport trims), as it is to say goodbye to the fun little Fiesta (especially in ST guise), and the once very popular Focus (which finally gets an update for 2019, and ditto re the ST and RS). This said I won’t miss the aging C-Max or the equally dated Taurus, although the new Lincoln Continental that’s based on the latter is extremely good and will be a loss to the value-oriented luxury sector, while the MKZ is pretty good too, especially in Hybrid trim. I’ll soon be publishing reviews of some of the above, so stay tuned as they remain worthy contenders that deserve your attention. Such is the case for this 2018 Fusion Hybrid Titanium. Ford gave the entire Fusion line a mid-cycle makeover last year and I really like the changes made, especially the grille that looks more like the Mustang and sporty Focus ST’s design and less like a ripped off Aston Martin. Ford added some shape to the headlamps and modified the lower front fascia as well, while the strip of chrome trim spanning the rear trunk lid and striking through each reworked taillight totally changes the look of the car’s rear end. They’ve gone from a focus on sporty to classy, while once again creating a more original look. All round, the visual changes are good. Like with most refreshes, changes to the Fusion’s interior weren’t so dramatic. The most notable update would be to the lower centre console that swapped out the old shift lever for a much more modern and up-to-date rotating gear selector, this even rimmed in stylish knurled metal edging for a premium appearance and impressively substantial high-quality feel. As far as unconventional transmission controllers go, I prefer this dial design much more than others, including Lincoln’s heritage-inspired pushbutton layout. It’s simply a more natural progression, and intuitively falls to hand. As with the previous Fusion, this renewed version is nicely finished with good quality materials, especially in Titanium trim that’s near top-of-the-line for the Hybrid (top-tier Platinum is downright ritzy). There are plenty of soft-touch surfaces, plush leathers, metallic accents and high-quality switchgear. Specifically, Specifically, along with the dash top, door uppers, inserts and armrests, Ford covers the sides of the centre stack and lower console in high-grade padded pliable plastic, even wrapping the soft stuff around the backsides of the centre stack buttresses. The quality of the centre stack and lower console surfacing is excellent too, and much denser than most others in this class. The same can’t be said for the solidity of the metallic trim surfacing, but still it looks very nice and is well put together. Where this car differentiates from its Lincoln counterpart is in the hard plastic used for the glove box lid and much of the door panels, but like the MKZ its graphic interfaces are superb. This latter attribute has been a Ford strongpoint for years, the automaker leading most rivals in infotainment thanks to money well invested in its much-lauded Sync interface, this latest Sync 3 design one of the best in the industry. Graphically its modern and attractive, while more so it executes functions quickly, is easy to figure out, can be used with tablet-style gesture controls including tap, pinch and swipe, and comes filled with the types of features most users want, such as Apple CarPlay, Android Auto, all the usual climate and audio controls, apps galore, plus more. Ford improved the Fusion’s convenience and safety offering by making some of the latest advanced driver assistance systems (ADAS) available prior to last year’s mid-cycle update, such as automatic high beams, lane keeping assist, and blindspot monitoring with rear cross-traffic alert, all available on the 2018 model when adding the $1,950 Driver Assist Package that also includes rain-sensing wipers, a heatable steering wheel, and Sync Connect. Of note, all of these systems and more come standard as part of a suite of ADAS features dubbed Ford Co-Pilot360 for the 2019 Fusion, which also gets a mild restyle. Back to 2018, adaptive cruise control with stop-and-go, which also includes pre-collision assist with pedestrian detection, can be chosen separately for another $1,500, as can semi-autonomous park assist for an additional $600, while inflatable rear seatbelts improve rear passenger safety for $250. Incidentally, all of the pricing shared in this review, including the 2018 Fusion Hybrid S model’s $29,588 base price, can be found at CarCostCanada.com, as can dealer invoice pricing (yes, the actual cost the dealer pays) and key information about rebates that could save you a lot of money at purchase. 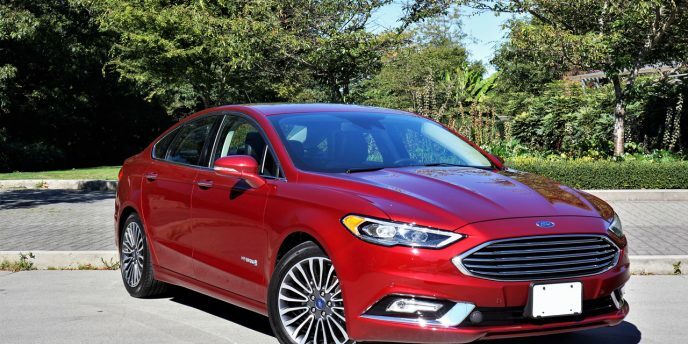 Before getting too far ahead of myself, standard features with the $34,988 Fusion Hybrid Titanium (currently offered with a $1,500 delivery allowance to help offset the $1,750 freight fee, plus a $3,737 as-tested Ford Employee Pricing Adjustment) include 18-inch machine-finished alloys, LED headlamps with LED signatures, LED fog lamps, LED taillights, extra chrome trim, a rear spoiler, remote engine start, Ford’s exclusive SecuriCode keyless entry keypad, proximity-sensing access with pushbutton ignition, ambient interior lighting, aluminum sport pedals, an electromechanical parking brake, auto-dimming rearview and driver’s side mirrors, a leather-wrapped multifunction steering wheel, two 4.2-inch colour multi-information displays within the primary instrument cluster, heatable 10-way powered leather sport seats with two-way driver’s memory, dual-zone auto climate control, a rearview camera, 12-speaker Sony audio with satellite and HD radio, a household-style 110-volt powerpoint, rear parking sensors, a capless fuel filler, individual tire pressure monitoring, Ford’s MyKey system, SOS Post-Crash Alert, all the usual active and passive safety features including dual front knee blockers, and more. Ford offers the no-cost choice of Ebony black or Medium Soft Ceramic cream/beige interiors as well as seven base colours plus three optional hues, my tester finished in $450 Ruby Red over Ebony, while additional options include voice activated navigation for $800, three-way cooled front seats for $528, a powered moonroof with a garage door opener for $1,250, etcetera. Where some other Fusion models are focused more on performance, Sport trim immediately coming to mind, the Hybrid Titanium is more about smooth, refined comfort. Truly the ride is sublime and eCVT automatic transmission is wonderfully linear in operation, both promoting a more relaxed driving style. That’s not to say it won’t move off the line quickly when prodded, its 2.0-litre Atkinson-cycle four-cylinder and electric motor combo good for a reasonable 188 net horsepower and 177 lb-ft of torque resulting in a zero to 100km/h run of about nine seconds. It’ll push through corners adeptly too, the Hybrid actually feeling quite sporty when putting your foot into it, but that’s clearly not its priority, while if you don’t try to extract everything from the throttle and push the envelope amid curves you’ll likely never know it has any go-fast performance capabilities hidden deep within. Therefore, other than for testing purposes, I drove it like a grandpa on his way to church (not late for church, mind you) and thoroughly enjoyed a leisurely week, always comfortable in its extremely supportive driver’s seat, and fully appreciative of the laid back state this car put me in. I was also appreciative of the $8 in fuel I used all week, and it wasn’t due to a lack of driving. The Fusion Hybrid’s claimed Transport Canada rating is a very stingy 5.5 L/100km city, 5.6 highway and 5.6 combined, which is shockingly good considering its size, mass and luxury equipment load. Factor in fuel costs that float around the mid-$1.40 to $1.50 range in Vancouver, which are highest in our history, and the Fusion Hybrid is more relevant today than ever. I only hope Ford applies this technology to its upcoming Focus Active and some of its SUVs, as it can really make a difference to the bank balance. The Fusion’s cabin is slightly smaller than some of its more recently updated Japanese competitors, particularly in the rear, but it should be large enough for most body types and I found it thoroughly comfortable from front to back. Its cargo capacity is limited somewhat too, due to the lithium-ion motive battery encroaching on trunk space. Ford doesn’t try to hide this issue, the battery pack jutting up to partially block some of the 60/40 split rear seatback’s passageway, but some capability of loading in long items is appreciated just the same. This said at 340 litres (12.0 cubic feet) it holds more volume than some competitors, but those considering a Hybrid over a conventionally powered Fusion might want to consider life with a 113-litre (4.0 cubic-foot) decrease in golf bag hauling capability. This and its declared demise are the only two knocks I have against the 2018 Fusion Hybrid Titanium. It’s a handsome, well built, comfortable, amply featured, smooth riding, ultra efficient mid-size sedan that deserves its third-place Canadian standing, making it all the more disheartening that its end is near. Being that it won’t be collectable after three or so years (or ever), you’ll need to factor its cancellation into its resale value, which will most likely negatively affect your overall cost of ownership. Then again the car represents good initial value, which could alleviate some of the financial pain. In other words, if you’ve got your heart set on a new Fusion, bargain hard and voice concerns about its cancellation during negotiations. I think your local Ford retailer will be more than happy to give you a very good deal on what is essentially a very good car. The Focus certainly qualifies for the first, with Ford offering plenty of rebates and its dealers providing healthy discounts for anyone wanting a 2017 model, especially now that 2018 models are arriving. As for the second issue, the Focus continues to struggle in third-party dependability studies, with Consumer Reports saying "it's plagued by poor reliability and, at low speeds, a jerky transmission," and J.D. Power and Associates giving it just two out of five for powertrain mechanical quality and powertrain design, plus the same low score for body and interior mechanical quality. Yikes!